Italian Silent Cinema: A Reader, edited by Giorgio Bertellini (Associate Professor at the University of Michigan), is a complex, ample and exhaustive volume, composed of thirty articles by Italian and non-Italian scholars, with around 150 images, three detailed indexes, four hundred pages of a fairly big format, and a bibliography of more than thirty pages. It is the first book of this kind in English, and one has only to look at the acknowledgments to recognise the kind of far-reaching project that Giorgio Bertellini took on for this book. In his introduction he sketches a short history of Italian Silent cinema, from its beginnings to the development of the 1910s and the advent of Futurism: “If Italy’s most prominent avant-garde movement combined destabilizing aesthetics with sympathy for aggressive and chauvinistic ideologies, Italian popular cinema did not experience a radically different destiny” (4). The Reader combines general analysis with very detailed case studies, from an array of different perspectives and points of view. Overall, a novice of Italian Silent Cinema will find a fairly wide and comprehensive view on the subject here. It is a vibrant period in Italian Film Studies: we are witnessing the rediscovery of hitherto very little studied aspects of Italian cinema, at least in the English speaking world (popular cinema, to name but one), the nourishing of different approaches and theories applied to Italian cinema, together with the publication of collective volumes, such as The Italian Cinema Book edited by Peter Bondanella. Hopefully this Reader will contribute to the study of the earliest period of Italian cinema in departments and programs in English speaking universities: it is not a coincidence that only less than half of the contributors of this volume are based in US or UK universities; the great majority are Italians, and many of them also based in Italian institutions. Much needs to be done, but this book is surely a great starting point. The Reader begins with a set of introductory and general articles. The first, authored by Gian Piero Brunetta, the most prominent Italian film historian, is a short journey into Italian cinema historiography. 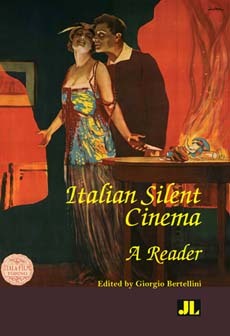 Among the fundamental stages are the beginnings of the proper studies of silent cinema in Italy and worldwide in the 1970s, the publication of Cinema muto italiano (the landmark work by Aldo Bernardini), and the establishment of the first doctoral program in Art, Music and Performing Arts (known as DAMS). Paolo Cherchi Usai’s ‘A Brief Cultural History of Italian Film Archives (1980-2005)’ focuses on archival issues: which films are preserved in Italy, how, with which resources, who are the pioneers in the field, and which are or could be the relationships between Italian archives and academia? Carlo Alberto Zotti Minici explores pre-cinematic visual culture: by virtue of its natural and urban marvels, Italy was a privileged subject for the magic lantern, mondo nuovo, and various kinds of views. A fairly widespread perception says that cinema was a new phenomenon that radically broke with the past but, for Bertellini, in his ‘Photography and Cinema, and Vice Versa’, continuity is preferred to discontinuity. He highlights three areas of intermedial intersection: film exhibitions largely due to the initiatives of individuals (most notably Filoteo Alberini, Arturo Ambrosio and Henri Le Lieure); film production, with its focus on filming photographic landscapes, a tradition that in Italy goes back to the Grand Tour, and on photographic portraits; circulation, with the analysis of a number of intersections between cinema and the visual arts. Marco Bertozzi’s ‘Visualizing the Past: The Italian City in Early Cinema’ considers the representation of Italian cities from the Lumières’ camera operators, who embarked on what the author refers as the last Grand Tour of the 19th century, to the beginning of Fascist cinema. Bertozzi discusses how the first film dal vero (or actualités) filmed in Italy followed the painting tradition of vedutismo, a 19th century mode of painting Italian cities and landscape. He notes that Lumière’s operators, albeit not engaging in an exhaustive project, focused on specific subjects: for example, Turin emerged “as a political capital and the official centre of national administration and military power, consonant with Lumière’s own ambitions toward cultural prestige and officialdom” (69). But, I would suggest, Rome also emerges as a political capital and centre of power, and we find evidence of this in number of films, such as Carabiniers, Infanterie, Assaut au fleuret, Assaut au sabre, Assaut d’épée, Anniversaire du roi Humbert Ier (Rome), and Funérailles du Roi d’Italie Humbert Ier, to name but a few. The Lumière’s operator tended to represent Italian cities as “somber and peaceful”, but slowly different images emerged especially with films set in the South like Sperduti nel buio and Assunta Spina. A new urban realism was now on the screen, and “the city acquired an utterly new complexity” (73). The four articles that follow are dedicated to the most important production companies of the time: Claudia Gianetto talks about the Ambrosio company of Turin; Silvio Alovisio about Italia Film (also from Turin) and Giovanni Pastrone; Kim Tomadjoglou analyses Società Italiana Cines, from Rome; and finally Raffaele De discusses the Milanese Milano Films. These companies share some common features: as De Berti writes at the end of his essay, “The history of Milano Film appears to be quite symptomatic of the broader industrial trajectory of Italian silent cinema, from the international success of the early 1910s to the breakdown of the mid-1920s” (120). This, with differentiations and exceptions, is true for a number of other companies of the time. But each should also be remembered for specific reasons: Ambrosio for the explorations of cameramen such as Giovanni Vitrotti and Roberto Omegna, and for the production of two versions (1908 and 1913) of The Last Days of Pompeii; Itala film is the production company whose name is linked to Giovanni Pastrone, the deus ex machina behind the production of one of the earliest international canonical films, Cabiria. He developed a “vertical structure, still hesitating between a direct (almost artisan) control of every step of the process and a hierarchical distribution of tasks” (89). Other important films produced by Itala are La caduta di Troia, the famous series of ‘Cretinetti’, and a number of farcical comic scenes. On the latter, Alovisio poignantly argues: “The trivial nature of these carnivalesque inversions combined with the characters-heroes’s limited interest in the outside world […] kept these comiche from being socially subversive. Instead, their ideological ambiguity displayed conservative traits: they ended to enforcing an ultimate sense of interclass compromise and unassailable social stability” (91). There is still little research on politics and early cinema, and certainly these comments go in the right direction to try to expand this field. Tomadjoglou dedicates vast attention to Cines’ presence in Europe and its relationship to the US, in particular with George Klein. The company focussed on glorious ancient Rome, with films like La rivale (1908), Giuseppe ebreo (1911), and most famously Quo Vadis? (1913). Similar to the other companies’ masterpieces of the time (eg. Itala’s Cabiria), Quo Vadis? marked the highest point of the company and the beginning of its crisis. Finally, Milano Films, as De Berti recalls in his brief but exhaustive article, combined “cultural goals, wealth of investments and market success to lack of industrial planning and business expertise”. Pedagogy, also a rather understudied topic in Italian silent cinema, is key for this company: “Given the nation’s high illiteracy rates, Milano Films’ noblemen felt entrusted with a pedagogic and paternalistic responsibility, which participated in the moral and cultural uplifting of the popular film shows” (114). The situation in the south of Italy was fairly different, as Bertellini argues in his ‘Southern (and Southernist) Italian cinema’. Film theatres were scarce, and mostly located in urban locations, but very important, especially in Naples, was the phenomenon of the café-chantant – venues where a number of different shows took place, of which cinema was one. Cinema unfolded alongside and was deeply influenced by regional theatre and popular songs; however, films set in the South (and filmed, for example, by the Edison’s operators) travelled because of what they represented, namely “Southern Italian backwardness and primitivism (125)”. Sicily and Naples, the two biggest cinematographic poles of the South, have quite different stories in relation to filmmaking: in the latter, production was intense at least until the arrival of the Fascist censorship, while in Sicily, with small exceptions, real production never really took place, and Sicilian intellectuals like Verga and Capuana did not wish to collaborate with the new medium – very different from D’Annunzio, or even from the Neapolitan writers. Still, Sicily saw the birth of the remarkable Sperduti nel buio and remained a very appealing set for producing film, but also for reflection upon the inner nature of cinema, as Jean Epstein and his seminal essay Le Cinématographe vu de l’Etna demonstrate. Luca Giuliani’s ‘From Wonder to Propaganda: The Technological Context of Italian Silent Cinema’ is a fundamental piece about technology and Italian silent cinema. Giuliani not only talks about the role of inventions in the cinematic apparatus – which in Italy were, at the time, few and scattered, mainly due to individual initiatives, often embarked upon by military or former military people – but he also manages to put this in a broader context, showing the link between technology and cinema within the cultural and political Italy of the time. He concludes that “the Italian production system relied on a cultural tradition centered upon artisanal quality and a long-established and efficient workshop system that could compensate for the nation’s technological lag and its marginalization from the industrial transformations occurring elsewhere” (149). Jacqueline Reich’s article, ‘Italian Cinema in the 1920s’, brings us into probably the least important decade of Italian cinema, one that witnessed “a sector fractured by a regionally-based rather than a centralized mode of production”, and a “lack of technical and narrative innovation especially in the development of synchronized sound towards the end of the decade; and fierce competition from abroad” (135). It was a crisis that followed the glorious 1910s and was perceived also as such at the time, as an article from the journal Film from August 1920 entitled ‘The Crisis of the Industry’ makes clear. In the first of eight articles on genres, Aldo Bernardini, the “godfather” of Italian silent film scholars, provides an interesting introduction to the non-fiction productions of the time. Starting with the important relationship of the Lumière brothers with Italy, and continuing with an analysis of the “fake-reportage” genre (most famously, those on the Italian-Turkish War), the author discusses eight of the film dal vero of which he is the Italian major expert, having recently published two books on the subject. He raises a point that recurs elsewhere here, as we have already seen: the absence, in early films, of “the period’s striking social and class conflicts. In their place, instead, there abounded productions of patriotic pageantry centered on public ceremonies and inaugurations” (159). Giuliana Muscio’s article is dedicated to historical films, a genre that made Italian silent cinema internationally renowned. The importance of this genre, which travelled internationally thanks to the investments of American companies and distributors (such as George Kleine), lies, among other things, in its powerful didactic purpose: “These films were modeled on the cultural and historiographical discourse that infused post-Unification school curricula: historical narratives centered on poets, saints and navigators, and the great deeds of illustrious men who brought honor and prestige to the patria” (165). This is a key point, useful in understanding the cultural mission of a large part of Italian silent cinema. What follows, in this exploration of the genres of the period, is a detailed paper by Ivo Bloom on the comedies of the time, a genre dominated by foreign stars like Ferdinando Guillaume a.k.a Polidor, André Deed a.k.a. Cretinetti, Marcel Fabre a.k.a. Robinet, and Raymond Frau. By the 1910s, “the rise of situational comedy went hand in hand with the gentrification of the film medium, the rise of the feature film, and the diversification of movie theatres” (177), a shift that affected the length of the films and set aside the old, vaudeville-style comedies. Angela Dalle Vacche, an expert on Divas and Diva cinema, discusses several Divas (the three most famous being Francesca Borrelli, Lyda Bertini, Pina Menichelli), putting them in the context of the early form of the exploitation of stars. Very popular were also the serials, which Monica Dell’Asta discusses in her ‘Early Italian Serials and (Inter)National Popular Culture’. Characters like Za La Mort, played by Emilio Ghione, or the strong men genre (most notably Maciste) were famous at the time and fit well in the star discourse. Maciste became an international icon, and Dell’Asta seems to suggest that these films anticipated and embody the values of the incumbent Fascism: “The Italian strong men were in fact embodiments of the status quo. Their apparent altruism (which was reinforced by their being perfectly asexual, so as to guarantee the lack of any personal interest in their actions), only expressed itself as a kind of punitive behavior toward any person who acted against property and institutional power” (200). On acting, Francesco Pitassio talks about the relationships with theatre, and the acting manuals that existed at the time. The author notes: how “In Italy rarely did montage fragment a scene, which was regularly conceived of as a homogeneous and whole space within which actors performed. Instead it was up to the actors’ skills and resources to address Italian cinema’s narrative and representational needs” (260). Futurism, the most famous cultural movement of the time, also features. “There is no single, all-encompassing notion of Futurist cinema” (203), argues Giovanni Lista. At first, there seemed to be a skepticism from the Futurist movement about cinema, but then some of its most prominent exponents, including F.T. Marinetti and Giacomo Balla, even embarked on the making of a film, Vita Futurista [Futurist Life, 1916]. Lista argues that the Futurists “rejected a notion of cinema as a mechanical and pseudo-objective reproduction of the outside world” and this leads to Lista’s brilliant point: “Early popular cinema, when it did not attempt to duplicate bourgeois art, was unknowingly and instinctively Futuristic […] With its direct and vital immediacy, the new art form of cinema embodied the same anti-bourgeois and anti-establishment expressivity extolled by the avant-garde manifestoes” (204). The so-called second Futurism of the 1920s and 1930s and Stracittà (hyper-city), a vast cultural movement of the time, are the focus of Leonardo Quaresima’s paper. These films, due to their suspect link to Fascism, have been hitherto largely ignored, but they do reveal connections to the well-known city symphony films and also links to the lively experimental cinema of the time. A different project altogether is the one of LUCE (Educational Film Union), one of the main instruments of Fascist propaganda. Pierluigi Erbaggio’s essay manages to synthesise what has been written already on Luce with new archival material. Particularly interesting are the passages where Erbaggio describes how Luce managed to penetrate into the countryside thanks to travelling movie theatres, in a country where theatres were largely concentrated in cities. Of special interest is the section dedicated to periodicals, film theory and ‘film on paper’. John P. Welles’ ‘Film on Paper: Early Italian Cinema Literature, 1907-1920’ is an account of the relationships between cinema and cinema literature, meant in a very general way: “the various formats, evolving venues, and salient characteristics of Italian film writing understood in a wide sense” (236), spanning from the birth of the trade press in 1907 to the publication of the first volume of film theory in Italian, by Sebastiano A. Luciani. Early Italian film theories are also the main topic of Francesco Casetti’s ‘Italy’s Early Film Theories: Borders and Crossings’. This subject, too, is heterogeneous; it “appears to be largely trans-discursive, trans-national, and trans-ideological” (275). Casetti highlights how “what we have been describing as ‘theory’ consisted of a combination of a wide variety of discursive genres, registers, and styles”, from short stories and novels to interviews and sociological inquiries, and he furnishes a brief account for each of these possible “venues”, as well as of the first theorists like Canudo, Luciani or and Gerbi. He asserts: “cinema represents a privileged territory suitable to debate something else, the modern experience. Film theory is actually a speculative hypothesis about the new lifestyles designed and imposed by modernity” (279). John David Rhodes focuses on the rhetoric of nationalism in silent era periodicals. He discusses how Italy’s ancient past was used to glorify the present or to justify political choices (such as the war in Libya), and how “the historical film had to be policed more than other genres” because it was the most prominent genre abroad, and therefore significant in “propagating the prestige of the Italian film industry and the Italian state” (267). The penultimate section is dedicated to circulation, exhibition and reception. Three separate aspects are discussed: film distribution in Italy between 1905 and 1930 (Chiara Caranti), Italian silent films in Britain (Pierluigi Ercole), and local moviegoing (Paolo Caneppele). All three discuss methodological difficulties: the primary sources, the silent films themselves, are scarce, but tracing distribution patterns is equally complicated. For Caranti, State began playing a crucial role only in the 1930s, before “the lack of a solid entrepreneurial and industrial culture prevented the emergence of stable and effective commercial strategies” (292). For Ercole, Britain was a very important market for Italian films, if we consider that in 1911 as many as 748 Italian films were exported there, as opposed to only 254 to the US. Caneppele highlights the trends of local screenings in the silent cinema era – traveling shows, café-chantants, summer arenas, Politeama – but also explores less expected aspects, such as how we can study national ideologies and imaginaries from the name of the companies producing films or how we can look at the design of the movie theatres to speculate on which kind of audience them. The final two papers are focused on methodology and research. Ivo Blom provides a useful account about where to find Italian silent films: online, in DVD, in situ. Luca Mazzei does a similar job for printed sources, highlighting for example how theatre periodicals can be helpful, and mentioning a number of not well-known archives (e.g. the Fondazione Primo Conti in Fiesole) and other resources, such as censorship records and websites. These essays demonstrate the excellent quality of the Reader as a whole, and how it will stimulate further research on Italian silent cinema.